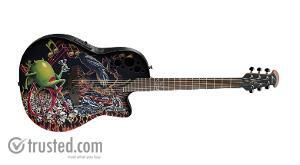 Ovation’s R&D team collaborated with Guns N’ Roses guitarist DJ Ashba to fine-tune every sonic and visual aspect of the four Limited Edition models in the Demented Collection. With its spruce top, high-performance scalloped X-bracing, and Mid-Depth cutaway composite body, the Bone Yard sounds as impressive as it looks. Ovation’s Slimline pickup has individual sensors for each string, and the OP-4BT preamp offers +/-12 dB control over the bass, midrange, and treble frequencies for great tonal flexibility.